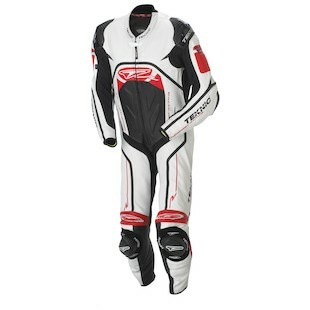 Packing a punch, the new Teknic Xcelerator Racesuit is utilizes perforated Kangaroo and top grade drum-dyed Brazilian cowhide. Known for its suppleness and low break-in time, Kangaroo provides the same abrasion resistance with 30% less weight than conventional cowhide. Multiple layer stitching and a double layer cowhide covers the abrasion areas. The list of features on this racesuit are impressive! To name just a few: Kevlar expansion panels for flexibility and unimpaired movement, CE-approved armor, CE-approved injection molded shoulder armor, dual compound nylon/aluminum elbow sliders, memory foam in collarbone, chest, thighs, tailbone and lateral impact points, speedstar knee sliders and CE upgradeable hip armor. The Xcelerator is available in white/black or white/red/black. Made with top grade drum-dyed cowhide, the Teknic Chicane Pants are a perfect match to the Teknic Chicane Jacket that was released earlier this year. Sport and track inspired, these provide extra protection through multiple layers of leather and extra rows of stitching in all the abrasion areas. 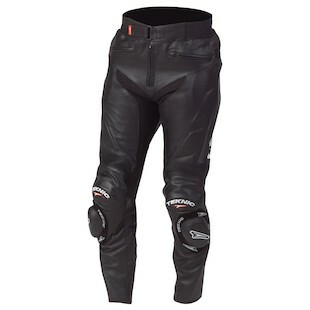 Knox CE-approved armor protects your knees along with hip padding that can be upgraded.